On September 5, 2017, Michael Gaddis, J.D. of Frontier Loan Group, Inc. (“FLG”) successfully avoided a Reverse Mortgage LESA and closed a reverse mortgage in San Marcos, CA. This reverse mortgage was very difficult because the borrower had significant credit issues to overcome. The borrower was in active foreclosure on both their 1st and 2nd lien (with active Trustee Sale Dates set by each lender) and had been in foreclosure on another property that they had recently sold. The borrower also had a Chapter 7 and a Chapter 11 bankruptcy on their credit, both of which had been filed and voluntarily dismissed within the past 6 months. In addition to working through the issues presented by these borrowers, Michael Gaddis, J.D. had to work with both Mr. Cooper (formerly Nationstar) and Bank of America to keep the looming Trustee Sales pushed off to allow for enough time to complete the reverse mortgage. As of 2014, all reverse mortgage applicants must undergo a Financial Assessment in order to determine a reverse mortgage borrower’s capacity and willingness to comply with their reverse mortgage obligations. If a reverse mortgage applicant fails the Financial Assessment the reverse mortgage lender may impose a Reverse Mortgage LESA. A “Loan Expectancy Set Aside” (“LESA”) is a set amount of money carved out from the reverse mortgage borrower’s eligible principal limit that is held in reserve in order for the reverse mortgage lender to pay the borrower’s property tax and hazard insurance obligations. The amount of money held back for the Reverse Mortgage LESA is determined based upon the borrower’s remaining life expectancy. For many seniors, the imposition of a Reverse Mortgage LESA can literally be the difference maker on whether or not the senior qualifies for the reverse mortgage. However, in this case, the borrower had documentable extenuating circumstances. In other words, the borrowers could prove that extraordinary events occurred which were the catalyst for their credit issues and foreclosure status. In order to have a good opportunity to overcome credit issues and/or a poor property tax/hazard insurance payment history (“Blemishes”) the borrower needs: 1) a descriptive narrative detailing out the events which caused the Blemishes (“Letter of Explanation”); 2) documentation corroborating the Letter of Explanation; and 3) a loan originator experienced in working with borrowers that have more challenging situations. In this situation Michael Gaddis, J.D. was able to provide a detailed Letter of Explanation which outlines all of the issues that caused the borrowers to have a poor credit history. The borrowers also provided Michael Gaddis, J.D. with over 600 pages of medical documentation supporting every detail outlined in Michael Gaddis, J.D.’s Letter of Explanation. After Michael Gaddis, J.D. submitted his Letter of Explanation and the 600 pages of medical documentation, the reverse mortgage lender took less than 24 hours to reissue a reverse mortgage approval with the LESA requirement removed. 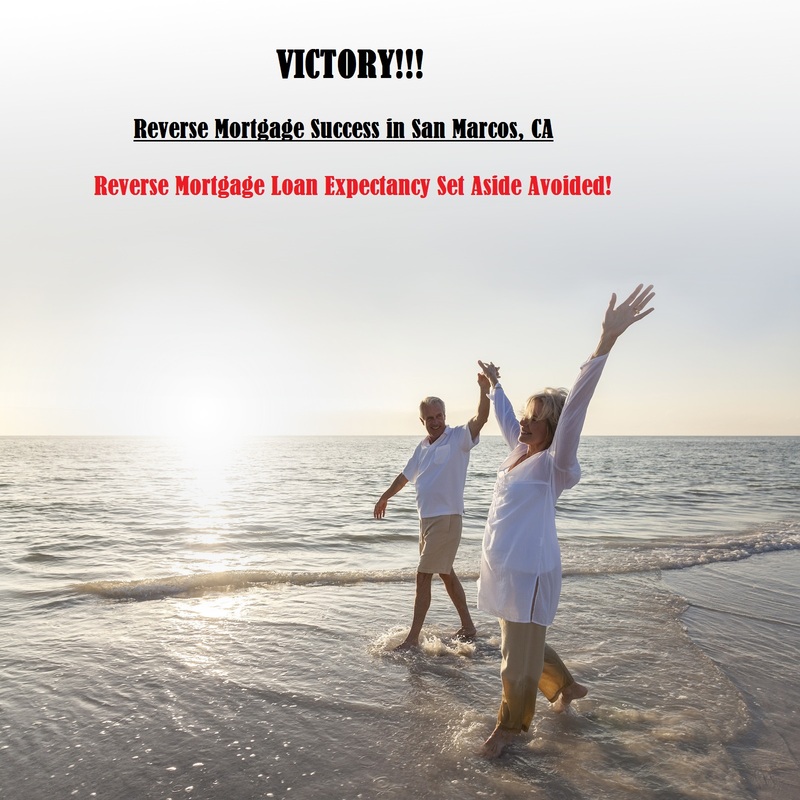 The end result was that instead of obtaining a reverse mortgage with no line of credit, the reverse mortgage borrowers were able to obtain a reverse mortgage with a $73k line of credit. This entry was posted in Blog and tagged hecm financial assessment, HECM LESA, hecm san marcos, how to avoid lesa, reverse mortgage extenuating circumstances, reverse mortgage financial assessment, reverse mortgage lesa, reverse mortgage lesa avoided, reverse mortgage san marcos, reverse mortgage success. Bookmark the permalink.